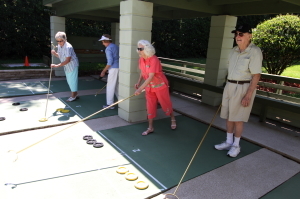 Central Florida is the ideal backdrop for retirement living communities. The sun shines year-round, there are plenty of things to do, and it is affordable for retirees. Hyde Park is a community where you will be able to stretch your retirement savings to the fullest in a pleasant residential setting that is conveniently located near a major city – namely, Orlando. We are a retirement living community full of men and women ages 55 and older who put a premium on staying active and squeezing the most enjoyment possible out of being retired. Through the provision of affordable manufactured housing, lots of amenities, and an advantageous location, we excel at providing retired individuals the opportunity to lead invigorating lifestyles right in the heart of Central Florida. We cordially invite you to contact our Lifestyle Team to learn more about our splendid retirement living in Central FL and perhaps plan a visit.